The RadMenu control can have its layout oriented in two directions - horizontal and vertical (similar to the StackPanel). By default the top-level items of the RadMenu are ordered horizontally. 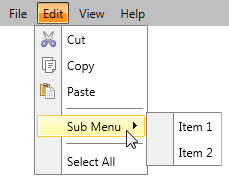 Note that the sub menu items are not connected to the orientation of the RadMenu control. Here is an example of a vertically oriented RadMenu.